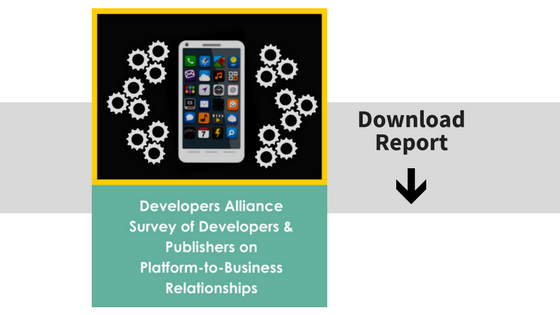 This survey builds upon the Developer Alliance’s previous research report in Fall 2016, Report on Competition in the Mobile App Ecosystem, and the follow-up in June 2017, The Mobile App Ecosystem Remains Stable and Competitive. Those reports detailed how publishers and developers find the mobile app economy competitive with a level playing field – a mature ecosystem facing the typical and predictable challenges that businesses in every industry face. In an effort to gain a more robust understanding on the relationship between developers and platforms, we launched a survey tailored specifically to these attitudes and opinions, including complications developers have faced due to platforms.